Caldereta is a Filipino stew that is usually prepared with beef or goat's meat. A usual party favorite, it can be made spicy if desired. The Caldereta sauce is flavored with tomato sauce and liver gravy and the vegetables include red bell pepper, potatoes, olives and sweet peas. The liver gravy can be made from scratch by cooking together ground beef liver, vinegar and beef stock and thickening with bread crumbs. A better and easier alternative, though, is to buy the canned liver spread or liver pate, which pretty much gives the same result. 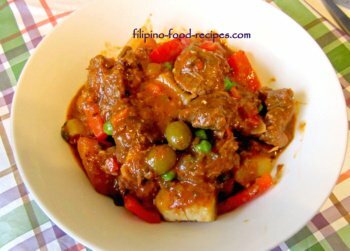 For Kalderetang Kambing, see the recipe here. 1 Boil the beef in vinegar, garlic, bay leaf and salt with enough water until tender. Separate the beef from broth. 2 Saute the garlic and onion and bell pepper. Add the beef and saute for 2-3 minutes. 3 Put in the tomato sauce, pickle relish and beef broth. 4 The potatoes go in next, cook for about 8 - 10 minutes or until both the meat and potatoes are tender. 5 If you are making the liver gravy from scratch, cook the above liver gravy ingredients in a pan until thick. 6 Mix in the liver spread or liver gravy to thicken, and season with sugar, salt and pepper. 7 Add in the green peas and olives and bring to a boil. You can use the Spicy Sauce Mix (Caldereta Mix) found in Asian markets. All you will need are beef, broth, veggies and liver spread, and follow the cooking instruction from the package. Pre-cook the potatoes either by frying or by par-boiling in water to cut down the cooking time. You can omit the olives and green peas if you don't like them. But add a little green bell pepper for a nice green contrast for dish presentation. Chili pepper are traditional for this dish, put just a couple in the beginning and just add some more towards the end so as not to overdo it and make the dish too spicy.